The indigenous people of Biafra have just recorded a major boost, as their cries for world attention has been heard, with Amnesty international just responding to the killings in the south-east. Amnesty International (AI) made it known to the public that it is investigating the clash between the Nigerian Army and the members of the Nnamdi Kanu led Indigenous People of Biafra, IPOB, in Umuahia, Abia state. This was made known in a statement on Friday by its Director in Nigeria, Osai Ojigho, said it was deeply concerned with the reports of cases of violence and illegal loss of lives following the clashes, cautioning the Nigerian army on the use of force on what it called armless civilians. “We are deeply concerned about reports of violence and alleged loss of lives across Nigeria following clashes between the Nigerian military and supporters of Indigenous People of Biafra (IPOB) in Umuahia, Abia state. 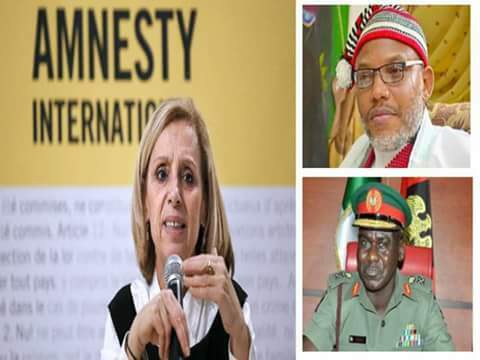 Amnesty International (AI) has said that it is investigating the clash between the Nigerian Army and the members of the Nnamdi Kanu led Indigenous People of Biafra, IPOB, in Umuahia, Abia state. “We are calling on the authorities to ensure the security forces prioritize the protection of people and avoid excessive force. “We are investigating all allegations of human rights violations and urge the authorities to investigate and quickly bring those suspected of unlawful killings and other serious violations to justice,” Ojigho said. Amnesty International recalled that in November 2016, it “published details of an investigation discovering mass extrajudicial executions and other serious violations by the Nigerian security forces during peaceful demonstrations by Biafran activists and other gatherings.